Even though the Peco stock was never actually used with the narrow gauge engines on the show, I still think they look pretty nice. I'm pretty happy with the wagons that I ordered from ehattons. That being said, I do plan on picking up some kits from the site Michael provided earlier at some point next year since it would be ideal to have Skarloey pull some slate wagons or some accurate coaches that were used on the show. My Christmas haul. Lots of Bachmann stuff this year! The quality of everything is great. I think Skarloey has exceeded my expectations and I want to do a proper review of him soon. So you got Skarloey, Red Coaches, Sodor Fuel Tanker, Thomas Resin Buildings, Hornby Sentinel Shunter and some other wagons? That was a good haul. You are her lucky to have all of that. Very nice, Sparks! For Christmas, I got Salty and Troublesome Truck #3! Oh dear, I didn't get anything Bachmann-esque for Christmas this year, unforgivable, I know, other than some hook and look couplers and metal rail joiners-- hardly Bachmann Skarloey, but alas...next year I'll have to give "Santa" a bit more than a week's notice!! I figured I'd carry out my thoughts on Skarloey over to this thread as opposed to the Skarloey in Stock thread from earlier. Aesthetically, this is probably one of the nicest models I have ever seen produced by Bachmann. The quality and the detailing that they have put on Skarloey is phenomenal. Whether it's the addition of a number plate and lamp at the back or the handrail molded over Skarloey's head is simply amazing. The red livery on Skarloey looks stunning and I think it works even better on a diecast body than on a plastic one like the HO/Large models do. The rivet detail is especially impressive too, as mentioned earlier. The face is from the CGI series, but I honestly don't mind since it really captures the character Skarloey quite well. I also like how the eyes on the model don't move, even though it's a standard with most Bachmann models it's nice seeing Skarloey not go down this route. Of course the mechanism would be way too small for Skarloey, but it would save the hassle of getting a model with crossed eyes! I couldn't run Skarloey for very long since the power on this layout wasn't that great, but I'll have more of a chance to run him at our N scale club layout tomorrow morning. From what I have seen from a glimpse though, it is a pretty smooth runner and seemed to pull all of the Peco/Bachmann stock with no trouble at all. He also managed to handle the curves on the layout quite well too. A ready-to-run HOn30 model alone is amazing enough as it is, but one for the Thomas range is incredible. Based on what I have seen through social media, the forums, and YouTube, it's quite clear that this model has gained such a popular and strong following. Bachmann have really outdone themselves with Skarloey this year and I look forward to seeing what they can do with this range once the 2016 announcements are made. I also got two of the red vans in the mail too, which I was hesitant to order at first because of their prices, but the lower price at shops got my dad to order two of them for me. I have to admit while they do look nice and I am glad I got them, I would have preferred to see a new tooling for rolling stock since they are Peco vans repainted. Not that it's a bad thing by any means, but it's underwhelming when you compare this to the high quality and effort we have seen from Skarloey by himself since he is one of the best models I have seen from Bachmann. It wasn't just the tooling or even the boxes alone that Bachmann have used from Peco, but I also found out that you can even find the Peco logo at the bottom of the Bachmann vans with the Bachmann logo placed alongside it. I have to admit that with all of this coming from Bachmann this comes off as really lazy. But with all that said, I feel like the only reason this may be the case is maybe there was a double, or even triple standard with both the Thomas license as well as Peco for allowing Bachmann to use this tooling for their Thomas range. This is really the only reason I can think of personally with the minimal effort and high pricing for the rolling stock, so I can kind of understand that if that were the case. But does this make the vans bad by any means? I don't think so. I think both the red and even blue vans from Bachmann look nice if you want to get something that matches the Skarloey railway color-wise compared to what's available from Peco. I don't own a blue one, but if I happen to come across one on sale then I might look into getting just one. So overall, while the rolling stock might not have been perfect, Skarloey himself was easily worth the investment and I am really happy that this is the first HOn30 engine in my collection. It took Bachmann a few years to plan this out and a lot of time and effort to make it happen, but it clearly paid off. Thank you Bachmann for making this happen! To my eyes, and for my money anyway, Skarloey is definitely Bachmann's most aesthetically pleasing model to date. Thanks to all those who posted pictures and videos of him, he really is an amazing looking model. It wasn't just the tooling or even the boxes alone that Bachmann have used from Peco, but I also found out that you can even find the Peco logo at the bottom of the Bachmann vans with the Bachmann logo placed alongside it. I have to admit that with all of this coming from Bachmann this comes off as really lazy. But with all that said, I feel like the only reason this may be the case is maybe there was a double, or even triple standard with both the Thomas license as well as Peco for allowing Bachmann to use this tooling for their Thomas range. This is really the only reason I can think of personally with the minimal effort and high pricing for the rolling stock, so I can kind of understand that if that were the case. But does this make the vans bad by any means? I don't think so. I have given that some thought myself, and to me it seems that's the only reason I can think of for why the pricing of the wagons is higher than the original Peco stock it's based off of, I'd say you're right on the money in terms of the double (or possibly triple) licensing standard causing the inflated price tag when compared to Peco's original wagons. Coincidentally enough the other day I found myself in a topic back from 2013, (long story as to why I was looking back that far, anyway) I saw a few posts from a few members, talking about Diesel 10 and the Narrow Gauge engines, and how even though Diesel 10's claw seemingly exceeded loading gauge, and it would be difficult for Bachmann to produce, he was still a more likely candidate than the Narrow Gauge engines (funnily enough, I remember my younger self reading over those exact posts and actually agreeing with them). 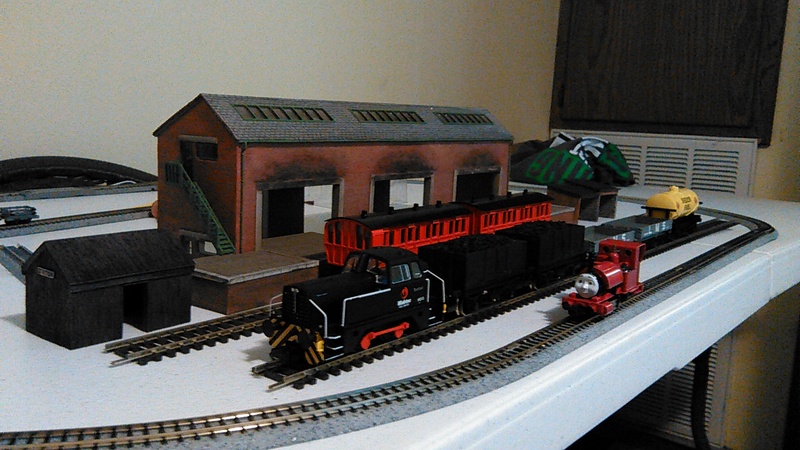 So I think Bachmann deserves a big thanks and congratulations on producing such a high-quality Narrow Gauge engine. I look forward to what the future brings to this new range. I have so got to get Skarloey. I want him even more every picture I see. The Box Van - Red is brilliant as well. It looks perfect to the TV Series (The model era). Te red is so bright and it just looks the part. It's perfect. I want a set of 3 of them, but I am not sure where the money will come from though! I must say I love all the pictures that have been taken. If I had the time and money to get Skarloey, I definitely would! I agree, to be honest with you. The pictures that have been posted of Skarloey makes me want him more and more but the only bad thing about it that none of this is good for my wallet! Yes, Skarloey does look great. What do you mean by MSRP and do you not have your own money too spend? Hobbylinc has a pretty good deal on Skarloey for $93, but they're out of stock right now. Do you what know the postage cost would be at Hobbylinc though to buy one and ship it to the UK, where I live? The question about not having enough money for a Skarloey model seems like it's best left to a personal message, as that is kind of a personal question. Also, just saying, it's quicker to open up a new tab (or window) on your browser and look up what MSRP means than asking in this topic and then having to wait for a response. Thankfully I can tell you that MSRP = Manufacturer's Suggested Retail Price. Again, it would be quicker to just open up the site in your browser in a new tab or browser, add Skarloey to your "basket", set your location to "UK" on the preorder screen, and then see what appears down the bottom, don't put any address or card details in, and from there it should tell you down at the bottom of the page how much shipping will cost, alternatively the website should have a "contact us" section on it somewhere, almost all professionally run websites do. Contact the Email address or phone number that should be provided to find out how much shipping to the UK is, it's a lot quicker than asking on here, as members here will probably respond slower than the professionally run website itself. On a different note, does anyone intend to make the slight bulge on Skarloey's funnel a brass colour? Like it was seen in season 4? If I get a model, I've considered using some masking tape to colour that small part of the funnel brass, but I probably won't in the end, even if it would be nice. For those of you who don't know that the funnel changed. Below are two images to show what I mean, the CGI model and the season 4 model.